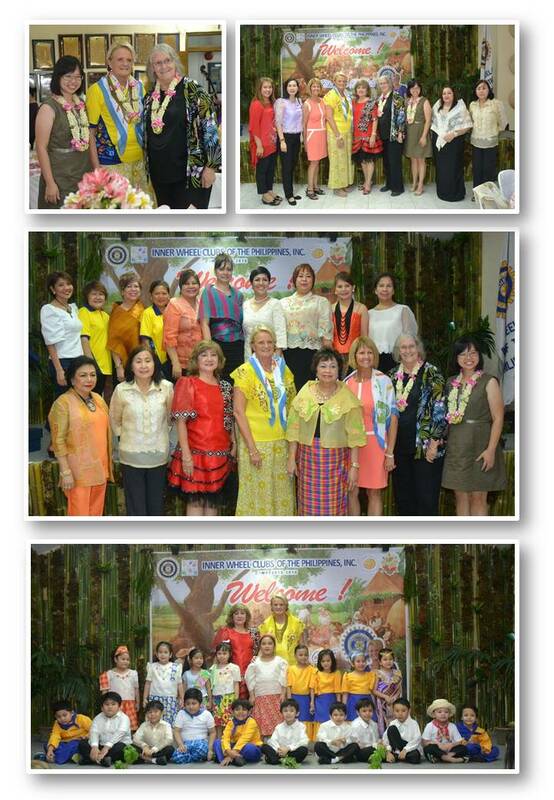 International Inner Wheel President Charlotte de Vos arrived last February 16, 2016 for a 4-day visit to our country. She will be going to the different club projects around Metro Manila and will be the Guest of Honor and Speaker to the Inner Wheel Clubs of the Philippines, Inc. 50th National Conference on February 20 and 21, 2016. She was welcomed by National President Cecilia “Cecille” Ferrer and National Representative Margarita “Margie” Ortiz Luis together with Past National President Victoria “Vicky” Magadia. 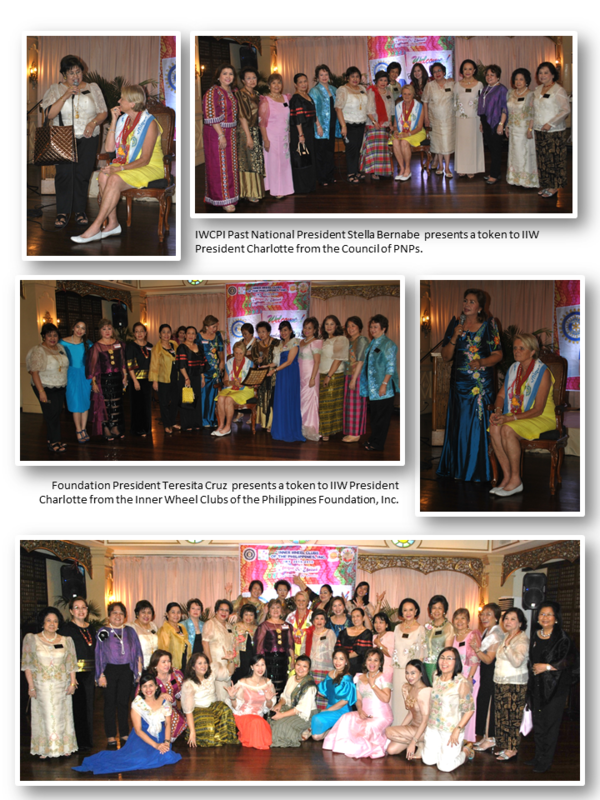 Council of Past National President, IWCPI National Board of Trustees and Inner Wheel Clubs of the Philippines Foundation, Inc. (IWCPFI) hosted a welcome dinner for IIW President Charlotte at Illustrado in Intramuros Manila. Also present is Honorable Roland Van Remoortele, Ambassador of Belgium to the Philippines. The attendees were all impressed with the performance of Universidad de Manila Dance Troupe who showcased the Philippine culture through dance from Mindanao. The IWCPI National Conference Working Committee hosted a Barrio Fiesta Dinner for her at the IWCPI Headquarters the following day. This is a meet and greet not only of the members of IWCPI but also members from other countires who flew in to Manila to attend the IWCPI National Conference. A very festive mood for everyone as guests were welcomed with a Rondalla. 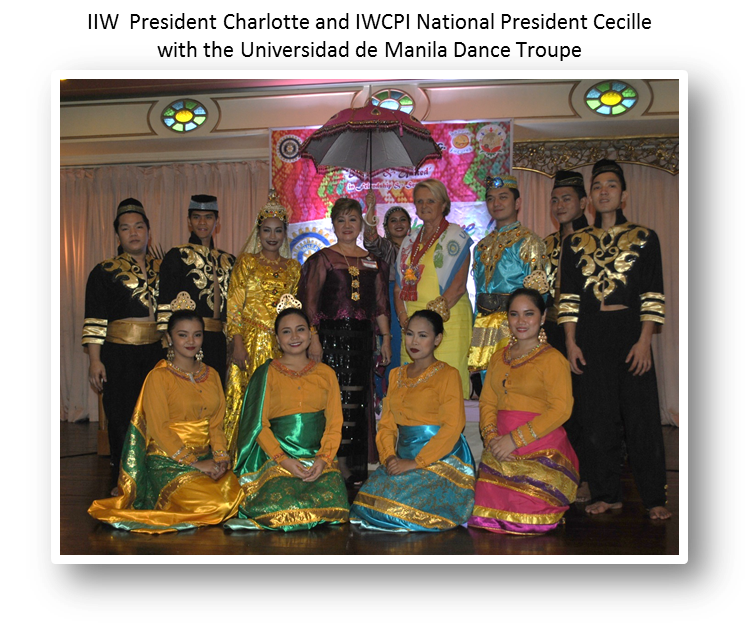 The students of the Day Care rendered a Philippine Folk Dance number for IIW President Charlotte.